The 35 mm. dish (Series 3500): 35 x 10 mm. 22 mm. - 'Series 3522'. Dishes and lids in transparent, as well as in black. All 'HB' Series are packed per 20 units in sleeve, 10 sleeves per case. All 'GW' Series are single unit packed, 120 units per case. All 'KIT' Series are packed per 20 units in a sleeve, 25 sleeves per case, 500 cover slips and 500 DS-adhesive rings. Note: The ASSEMBLY DEVICE for the KIT-dishes, comes separate. The 50 mm. dish (Series 5000): 50 x 7 mm. 40 mm. - 'Series 5040'. Note: The ASSEMBLY DEVICE for the KIT-dishes comes separate. 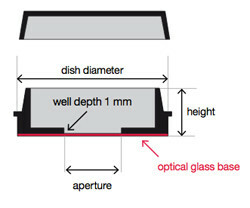 The cover glass thickness of Class #1.5H (170 micron, ra +/- 5 micron) we use, as a standard. Other thicknesses available. outer steep-walled shape. The contrary, they make a firm and robust first impression on the Microscope Technician. Fully robotized production, takes place in a Class VII Clean Room, certified: ISO 13485: 2003. The administration of our production, is certified: ISO 9001: 2000. Certified: ISO 11137-1:2006, ISO 9001:2008, ISO 13485:2012 and ISO 14001. 120 Units per case; STERILE R by Gamma irradiation, 10 kGy minimum. Gamma irradiation. NOTE: Sterile until packaging opened or damaged. dishes/lids, 500 DSA rings, 500 coverslips, a coverslip tweezer and a pair of rubbergloves. Safely and Quick'. With the "KIT", you will have a perfect WillCo-dish® and you also save a lot of money!